Give your Dad the most awesome gift ever this Father’s day!! 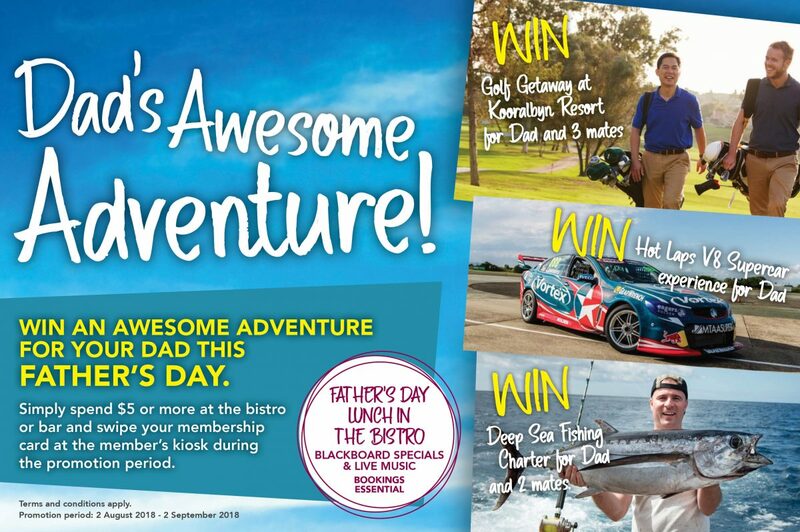 Enter our Dad’s Awesome Adventure promotion, and you could win one of 3 amazing adventures for your Dad. Golf Getaway for Dad and two mates at Kooralbyn Golf Resort including 18 rounds of golf, cart, one night’s accommodation and breakfast. To enter spend $5 or more at the bar or bistro any time from the 2 August to the 2 September 2018. Place your entry ticket in the barrel provided, and be present at the draw to win. Prizes are drawn on Father’s Day, 2nd September 2018 at 3pm.